Cells, biological circuits, and individual biomolecules organize themselves and interact with the environment. Use of these capabilities in flexible and economically efficient biotechnological production systems is in the focus of the “Molecular Interaction Engineering” (MIE) project. It is the objective to develop printed biological circuits and catalysts for biologico-technical hybrid systems. MIE will be funded with about EUR 3.5 million by the BMBF. 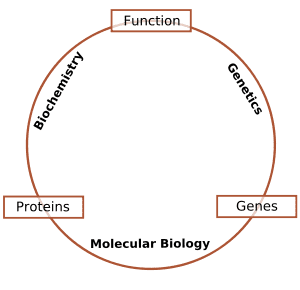 The capabilities of biological systems are based on specific interactions of molecular components. Due to their molecular fitting accuracy, for instance, enzymes allow for certain chemical reactions only. Some proteins bind via specific molecular interfaces to the DNA or other proteins and control processes in complex organisms. Sensors respond to defined molecular signals from the environment. The MIE project focuses on interactions of molecules, technical interfaces, and surrounding solvents. “Transfer of complex biological mechanisms to printable systems may result in innovative biotechnologies that might be the basis of a number of industrial applications,” Professor Jürgen Hubbuch, project coordinator at KIT, explains. However, conventional, continuous evolution of biological molecules reaches its limits. The key to innovative developments is the specific, adjusted construction of the interaction of complex biomolecules and fusion of these units with technical interfaces. This requires close cooperation of biology, engineering, chemistry, and physics. The “Molecular Interaction Engineering” (MIE) project combines methods of biotechnology, structural biology, materials sciences, process engineering, and computer simulation. Work is aimed at developing innovative, flexible, and economically efficient biotechnological production systems for molecules. These might then be used in biohybrid systems integrating biological and electronic components. Biohybrid systems allow for new applications in food technology, molecular biology, medical diagnostics, and pharmaceutical industry. April 17, 2019 - Qrons Announces Filing of PCT Patent -- Techniques for Promoting Neuronal Recovery NasdaqNEW YORK, NY, April 17, 2019-- via NEWMEDIAWIRE-- Qrons Inc., an emerging biotechnology company developing advanced stem cell-synthetic.